I represent District 1A for the MTA. 1500 members from the Berkshires. 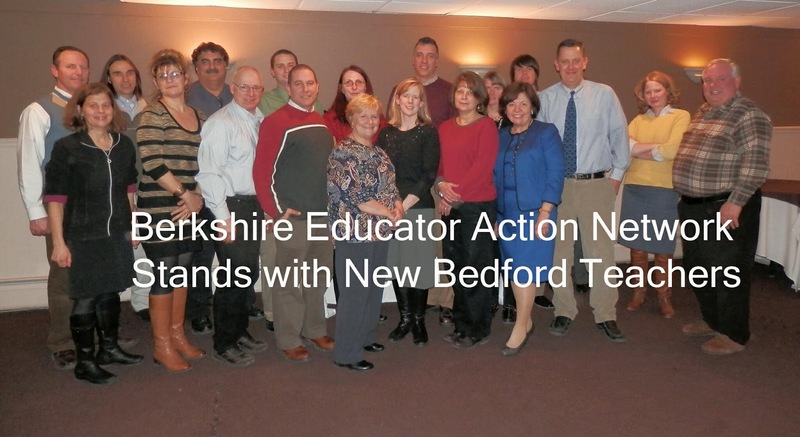 The presidents from the locals support the New Bedford Education Association and the New Bedford High School teachers in your opposition of Superintendent Durkin’s decision to implement the “Restart” model as the turnaround plan for New Bedford High School. Superintendent Durkin’s decision is an affront to the collaborative efforts that are necessary to successfully implement any meaningful change to improve NBHS. We are starting to organize and making plans for how we can help. Attached is a picture of us at our Presidents meeting last week.